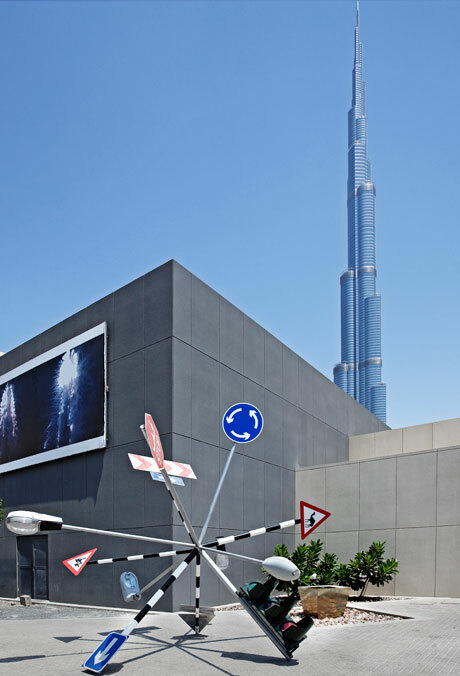 THE PAVILION DOWNTOWN DUBAI is a non profit contemporary art space providing a place to view, and participate in works by local and international artists creating a hub for a diverse range of art events offering a platform to promote an active arts community. The building was designed as a space where creatives could congregate and be inspired. It includes two gallery spaces, a library, lounge, restaurant, espresso bar and screening room. The spacious open-plan area is bathed in natural light and an unexpected natural oak semi-enclosed “shed” structure sits at the far end of the space. Behind it, a towering vertical garden adds another dimension to the minimal setting, introducing life, color, texture and originality. Massive communal tables reinforce the idea of dialogue and community.